"...and the Heir of Isildur was crowned King of Gondor and Arnor, and the might of the Dúnedain was lifted up and their glory renewed." 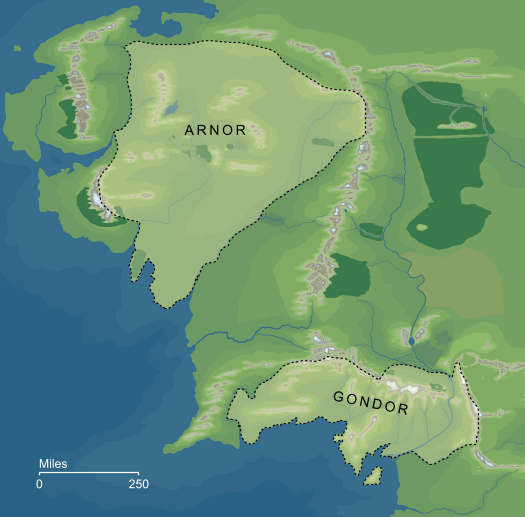 At the end of the Second Age, Elendil and his sons established two great kingdoms in Middle-earth: Arnor in the north and Gondor in the south. These Kingdoms of the Dúnedain were united under a single High King, Elendil himself, who ruled the North-kingdom while his sons reigned jointly over the South-kindom of Gondor. In the first years of the Third Age, this union failed. After the loss of Isildur at the Disaster of the Gladden Fields, his nephew Meneldil took up the kingship of Gondor, and that country remained independent from the North-kingdom through most of the Third Age. In the north, the realm of Arnor fell into troubled times. It broke into three separate kingdoms, and in time these too were lost, so that the Dúnedain of the North-kingdom of Elendil were reduced to a wandering people led by a Chieftain. Nonetheless, they were able to maintain Isildur's line in unbroken descent, while the Kings failed in Gondor, and its rule was taken up by the Stewards. There were two attempts to reunite the kingdoms, but only the second of these was successful. The first occurred in III 1944, when Arvedui of Arthedain claimed the High Kingship of the Two Kingdoms. His claim was rejected by Steward Pelendur and the Council of Gondor, who elected to maintain their independence. More than a thousand years later, after the War of the Ring, Arvedui's direct descendant Aragorn came forward to make the same claim. This time, the people of Gondor accepted a High King, and the Two Kingdoms were reunited at last. Unlike his ancestor Elendil before him, Aragorn took up his rule primarily from the South-kingdom, but he restored the old northern capital at Annúminas and dwelt there at times. The Shire was an exception to his rule, and though it lay within the Reunited Kingdom, Aragorn made a law that Men should not enter it, a law that he observed himself. After Aragorn's death, his son Eldarion took up the High Kingship, and the Reunited Kingdom endured for many years under the new King and his descendants.